A not to be missed annual invite-only event, the 4 year anniversary was, as always, an inspiring networking evening with innovative exhibitors, excellent company, great food and drink! Thank you to our extended community for your energy and continued support, we are looking forward to meeting the challenges and opportunities in 2019! Located on the KTH campus, our lounge and co-working space was transformed to an exhibition space with some of the sharpest startup enterprises showcasing their disruptive technologies and solutions. CE Check, Digital Nordix, Ekkono, Epishine, Greenlytics, H&D Wireless, Imagimob, Ingrid Cloud, Labtrino, Linkura, Mavenoid, Minnemera, Playitfair, Refind Technologies, ReVibe Energy, Scanbro, Tortalk and Waysure. Co-founder Magnus Melander presented TEC: a programme designed for corporates navigating the digital transformation with an interest to learn and facilitate collaboration between corporates and startups. With ever increasing interest and demand, almost 40 corporates have signed up already. The programme provides access to a fully tailored à la carte of services, drawing on THINGS considerable expertise and network to support each stage of the digital transformation process. ABB, Acal bfi, Acando, Akademiska Hus, Alfa Laval, Allgon, Assa Abloy, Bisnode, BSH, Coor, DSP group, FLIR, Gränges, Grundfos, Husqvarna group, Jämtkraft, Jönköping Energi, Loréal, NCC, Orange, Öresunds Kraft, Postnord, SAAB, Scania, SEB, Siemens, Stockholm Exergi, Storaenso, Tekniska Verken, Telia, Umeå Energi, Varberg Energi, Vattenfall and Verisure. THINGS is founder and project coordinator of the national initiative Ignite Sweden: steered brilliantly by Stina Lantz, who summarized an incredible year of achievements with ca. 1,300 meetings resulting in an impressive 45+ real life collaborations matchmaking large corporates with Swedish startups since the projects inception in 2017. Huge congratulations to Sven Lindström co-founder of Midsummer (https://midsummer.se), who is awarded THINGS 2019 Wall of Fame: presented each year to an exceptional individual who has built a successful business empire based on pioneering innovative hardware technology. Sven joins an illustrious group of previous recipients: Martin Gren (Axis Communications), John Elvesjö (Tobii) and Nicolas Hassbjer (HMS) and Stina Ehrensvärd (Yubico). Sven and his co-founders have taken a well-proven production technology from the CD industry and in an innovative way applied it in a new growing industry. Fifteen years ago, they started an ambitious development project, both technically and financially challenging, and have managed to develop a world-unique thin film solar production equipment. The development took several years and meanwhile the market for solar production equipment collapsed. With a great amount of stubbornness and unwavering endurance, Sven and his team have finally succeeded and sold several machine lines and last year successfully listed the company on Nasdaq First North. 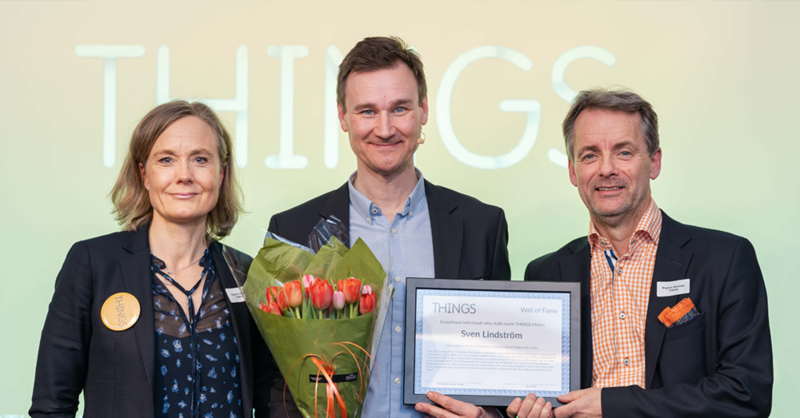 Sven Lindström, founder of Midsummer receiving THINGS 2019 Wall of Fame award, together with Katarina Fégeant, THINGS Acting CEO and Magnus Melander, THINGS co-founder.